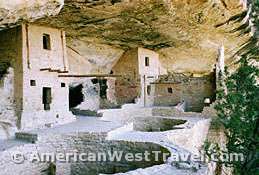 The Colorado Indian Artifacts Sites Section of the Canyonlands & Four Corners Travel Guide features the world famous Ancestral Puebloan - Anasazi - cliff dwellings at Mesa Verde National Park, as well as the exciting guided tours at Ute Mountain Tribal Park. Off-the-beaten-path opportunities are showcased at Hovenweep National Monument and Canyon of the Ancients National Monument. Ranger-guided and self-guided tours are available throughout the park, primarily to cliff dwellings and also to sites on top of the mesa. The most famous site is Cliff Palace, the largest and most elaborate known cliff dwelling. Another "can't miss" stop is Balcony House where you must climb a 30 foot ladder to enter the site. Cliff Palace, Balcony House, and Long House are visited seasonally by ranger-guided tours only, for which tickets must be purchased at the visitor center. Many other cliff dwellings are readily accessible by short and easy hikes. There is an excellent museum on top of the mesa showcasing many of the artifacts found at Mesa Verde. Other facilities include a visitor center, gift shops, restaurants, and lodge (advance reservations strongly recommended). There is a large campground at the foot of the mesa with a small number of RV hookup sites. Reservations are available. The park is about eight miles east of Cortez, Colorado, off of US-160. Visit time: at least two or three days to really enjoy the park. The up and down nature of the terrain makes the driving pretty slow. The campground and lodge are both quite pleasant. The upscale restaurant at the lodge serves very nice food. The Ute Mountain Tribal Park is physically adjacent to Mesa Verde National Park and preserves similar Ancestral Puebloan antiquities, particular cliff dwellings and rock art. However there is a significant difference. Virtually all loose artifacts at Anasazi sites on public lands have long since been looted or removed. Further, national park sites are highly developed and prepared for large scale tourism. At Ute Mountain Tribal Park, you will see artifacts all over the place, including pottery shards, cutting tools, corn cobs, and grinding rocks. The sites themselves have received only minimal stabilization for visitor safety. The roads are dirt, and the trails are rough. Access to the park which is along the Mancos River and tributary canyons is by guided tour only. The result is that the Ancestral Puebloan ruins of Ute Mountain Tribal Park are among the most exciting to visit because they project the feeling of having been only recently discovered. It has therefore been selected by National Geographic Traveler as one of "80 World Destinations for Travel in the 21st Century", one of only nine places in the United States so designated. Tours may be arranged through the Ute Mountain Tribe (see below). They meet at the visitor center, located at the junction of US-160 and US-491. Visit time: tours are a half or full day. Hovenweep National Monument protects six groups of highly unusual Ancestral Pueblo - Anasazi tower-like ruins scattered along the Colorado / Utah border north of Four Corners. The remote and undeveloped nature of the area offers the visitor a unique experience and perhaps a perspective into the ancient world. Many miles from civilization, the monument lies in a vast area of scrubby, open mesas broken by occasional shallow canyons. The look and feel of this place has changed little over the centuries. There are no services near the monument which has a nice campground. Access to the visitor center, campground, and the Square Tower Group (the principal attraction) is mostly paved. From Cortez, Colorado, take County Road G (the McElmo Canyon Road), and from White Mesa, Utah (just north of Bluff), take Highway 262. Watch closely for the turnoff signs to the monument. Visit time: one night at the campground, due to the remoteness. A real, off the beaten path place. One of the country's newest parks, Canyon of the Ancients National Monument preserves what is thought to be the largest concentration of archaeological sites in America, approximately 100 sites per square mile. These are largely the remnants of the Ancestral Puebloan - Anasazi and other Native American cultures. The large park is undeveloped with mostly primitive, dirt roads. Visiting the park would be an off the beaten path adventure for the self-sufficient. The Anasazi Heritage Center, the very fine museum in Dolores, Colorado (ten miles north of Cortez) serves as the visitor center for Canyon of the Ancients. Stop here for an orientation before entering the monument. The museum itself has much to offer with adjacent archaeological sites, interpretive programs, galleries of artifacts, and special changing exhibits. Visit time: a couple hours to visit the museum, a day or more to go into the monument. Before visiting Canyons of the Ancients, please stop at the Anasazi Heritage Center for orientation and update on current conditions.